I prefer kissing necklaces myself, but that might not be for everyone. Yep, though not that new. Thanks! Also – is this going to be our first real glimpse of the conspiracy? And continuing from what I posted on the last page, maybe we really talking about a person who’s descended from some royal/noble family; and if so might it become one of those stories, where a small group of people have been controlling the world from the shadows for generations? I sure hope we’re not going down the Illuminati route there. No, no, the Illuminati Route doesn’t go through Italy, you’re thinking of the De Medici Route. The Illuminati Route runs from Paris to Bonn to Zurich to Warsaw to Moscow. “I should NOT have said that…. Well, from the first chapter the story was centered around a shadowy world-spanning conspiracy that even the highest governments officials had no awareness of, who for some reason decided it would be a good idea to kill every single biodynamic with massive world-improving potential. I don’t think there’s any way this story could *not* go the illuminati route. I guess we’ll have to hope it’s not just a generic “Rich old people control the world and do evil things because they’re rich” conspiracy. Yeah, I guess. It’s just a bit, well… rote and unconvincing these days. Conspiracy theories leave a bad taste in my mouth after I realized that they have real consequences. As for the cabal here, I’m hoping for a level of nuance on the Deus Ex level. That’s about as fantastic as I like it, while still having stuff of substance to add. It was? I thought this was about a young adult woman who was trying to figure out what to do with her life after superheroing. Tiny cups for drinking caffeinated beverages in a formal setting have always seemed to be associated in my mind with very old cultures. The smaller the cup, the longer the culture has been around. Much of the Middle East? Tiny cups. France? Small but not yet tiny cups. England? Small but not yet tiny cups. Lady? Of course the pinky is extended. You missed Italy, where espresso was born. Those tiny cups always piss me off. Like, get me ten of them then jeez. You need someone to be making you stronger espresso. If you are not coffeineated after a espresso you are ether a caffeine addict or your espresso is way week. Takes a triple-yes,I’m an addict. Espresso has less caffeine than a cup of regular drip coffee. Since many people drink multiple cups of drip coffee per day…I guess you could describe them as ‘caffeine addicts’? Espresso is big on flavor, and fine on caffeine, but it is quite low volume. Anyway, it always bothers me when people equate espresso with “omg, SO much caffeine”. If you sub out your regular drip coffee for a double shot latte because you’re super tired that day, you probably shorted yourself on caffeine content. -sighs- I miss Ralphie May. His bit on Cuban coffee was side splitting. I don’t know man, and I’m in one of those loser countries. It cost so much too, it’s ridiculous. Thing I learned in England, the pinkie was an invention of the nobility in response foreign anglophiles and an emerging wealthy class that existed outside the aristocracy. If you did the pinkie, they knew you were “new money”. so what you’re telling me is the pinkie is Posh Englands version of ‘Straya’s great game of “Trick the Tourist”? But a matcha chawan isn’t a tiny cup. And matcha is about as formal as it gets. I really hope “Tony” isn’t a time-travelling Patrick from the future. Plot twist: Every character is a time-travelling Patrick from the future. Please, no. Not another McNinja roster. So, which one of them is it that has the power to make cups shrink? They’re actually giants. You’ll see when the tiny waiter comes back. Calling It Now. “Tony” is actually an immortal, one of Earth’s first biodnamics caused by The Prehistoric Event, which probably occurred while his pappy was out trying not to get killed by the wild animal he was stalking for breakfast that morning. You cribbed that from the second season of Heroes! Nope! I cribbed it from Vandal Savage; I’ve never actually seen Heroes. Wanna take bets he’ll have a moment comparable to Vandal Savage in Kingdom Come? Watch the first season – it’s pretty epic. The second season is filled with ever so much nonsense, you’ll feel the need to scream at the television. and a good deal of that is before the writer’s strike where they lost all their good writers… but Kristin Bell is totally hot in it so, there’s that. Interesting because they seem to be sitting in seats outside the cafe, which were clearly empty on the previous page. Maybe it’s a different cafe. Or they’re time-traveling bios with teleportation abilities. The cup shrank to like, half its size between pages. No, the man holding it is a size-changing biodynamic. He made the entire area around him grow, except the cups. He’s very powerful. When your power includes light weaving (remember the illusion she left behind in her apartment), a false facade wrapped around you is a legitimate power stunt. Okay, this has nothing to do with the comic (not yet, anyway), but for some reason it reminds me of SFP in a way I can’t quite identify yet. Specifically, the discussion around 2:10. This is pretty compelling stuff, considering when it was recorded (lates 1960’s) and the direct relevance to the current world situation. Sign of a good journalist is to see the trend in its initial manifestations. I think maybe it has something to do with people who feel they are different, who feel outside the normal channels towards success with no way into those channels, and the impulse to open those channels using violence.. sort of thing? I’m getting that same vibe – this is relevant in a way I can’t quite express. Neat find. just found this a couple nights ago, read the whole thing, and am clicking where the next arrow should be in a hopeless attempt to make the arrow appear and the story be finished so I can read it all. sadly, the future does not seem to be at my fingertips and I’ve gotta wait. 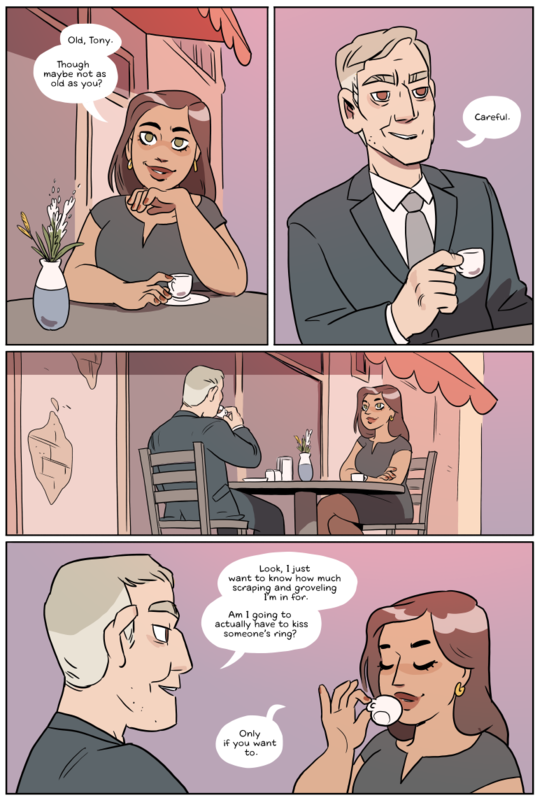 Announcement: SFP is now a comic about hoity-toity art dealers. The “SFP” acronym now stands for “Selling Frickin’ Paintings”. Thank you.